Imagine a stadium filled with thousands of fans booing and cursing, with frustration and hatred in their faces. All of the animosity is pointed towards you and at any point in the game at least half of the fans are likely to despise you. 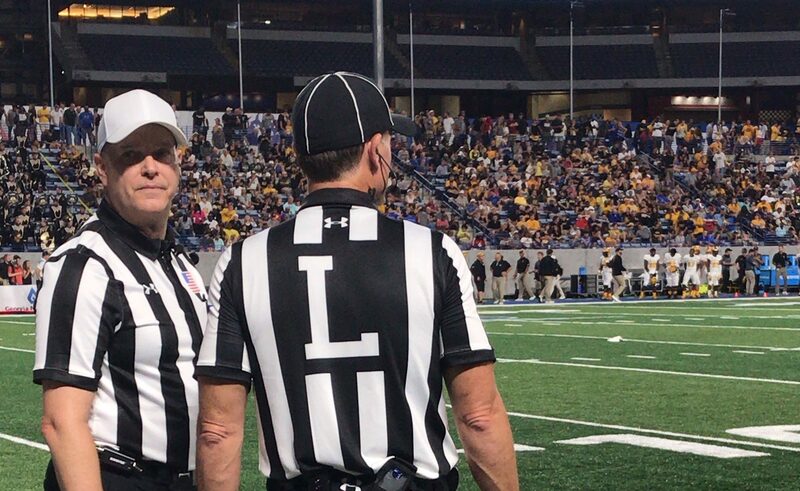 Alas, this is just another day at work for a college football official. Many people hardly think about the man behind the striped shirt, but officials for America’s four major sports—football, basketball, baseball and hockey—have an incredibly stressful job. These referees have a small margin of error and must pay close attention to detail in extremely fast-paced environments. The job also requires several hours of continuously being on your feet, walking and running without a break, not to mention the travel and preparation that goes into it throughout the week. Referees are required to count players, keep up with the clock and pay attention to formations. The game never slows down for them, and if anything it’s speeding up—the paces of college football and basketball have actually increased in recent years with up-tempo offenses becoming more popular. Football is especially difficult to officiate, and there’s been a growing shortage of officials at the high school, college and professional levels. NFL officials are also being stolen by TV networks as rules analysts. The networks pay much more than they would receive from the NFL for a much less stressful position, essentially to provide expert insight on the calls that current referees make. Officials are quitting and retiring faster than new ones join, and experience is becoming much more rare. Some officials work as many as 30 or more games a week and often work more than one sport. Keith Flo, a retired referee of 20 years, spoke with The Signal about his career as a baseball, basketball and football official. “Everytime you blow the whistle, somebody loves you, somebody hates you,” Flo said. Officiating is a thankless job, and referees are often treated worse than anyone on the field or court. They are screamed at by coaches and players on both teams and criticized by fans on both sides. The job is a constant balancing act of taking in all of the negativity and concealing any frustration or impartiality. Some officials even need therapy or professional help to deal with the stress of the job. NBA referee Joey Crawford admitted to ESPN that his therapist was the reason he didn’t lose his job. Crawford was on thin ice with then-NBA commissioner David Stern after multiple incidents of him losing his temper and ejecting players for trivial offenses like laughing sarcastically on the bench. One NFL official, Lance Easley, was actually diagnosed with PTSD after a blown call on the infamous “Fail Mary” in 2012 between the Green Bay Packers and the Seattle Seahawks. The process for training and development varies for each sport and at different levels. Typically officials have different clinics and workshops across the nation that they can attend during the offseason. These are not a requirement and expenses for traveling and attending clinics must be paid out-of-pocket, which further decreases the incentive to attend. A majority of officials, minus those at the Division I and professional level, also have another job. Part of perfecting your craft as an official is putting in those extra hours, either discussing rules with colleagues, travelling to attend clinics or watching film to assess how certain plays are called. This extra effort demonstrates the dedication that it takes to officiate well at a high level. Just like the athletes and coaches spend hours practicing, working out and watching film, officials have to sharpen their skills year-round. “These teams, they practice. They spend hours in the gym, so we have the responsibility as officials to make sure one, we’re in shape, two, we’re updated on the rules and three, is really calling a game as fair as possible,” Flo said. Officials are evaluated after every contest and your reviews determine future placement. Whether you get to call a tournament game depends on how you are evaluated through the season based on various factors. Punctuality and professionalism play a part but the main focus is how well you call the game. Basketball officiating is more reliant on judgement calls, as opposed to football which is more focused on rules. In basketball there is constant contact so a basic foul is usually the hardest call to make. Officials are under tremendous pressure, rarely get praise and are criticized in an instant for any mistake they make, so why take on such a demanding job? Simply put, for the love of the game. “It allowed me, as I got older, to stay attached to the games I loved,” Flo said. “It allowed me to be a part of the game as opposed to being a fan. I was never in it for the money. I would do the games for free,” Flo said. You also get the chance to watch stars emerge and develop over the years. Flo spoke about his experience watching two NBA first overall picks Derrick Coleman and Chris Webber going toe-to-toe in Detroit. Even though the gig is typically underpaid and underappreciated, at the end of the day the experiences and stories to tell are worth it in their eyes.